Scientists predict epidemic of type 2 diabetes in near future. Diabetes has high morbidity, mortality, and economic burden on society, the increase in cost is due to its complications and complexity of care. Type 2 diabetes occurs in genetically susceptible persons who are exposed to a number of environmental factors. Vitamin D deficiency might be an environmental risk factor since Vitamin D receptor is present in β-cells of pancreas and the 1-α hydroxylase enzyme which converts 25-hydroxyvitamin D(25(OH)D) to the active form, 1,25(OH)D, are present in β-cells., There was evidence that Vitamin D enhances glucose-mediated insulin secretion in rat. In human, Vitamin D enhances insulin secretion and has antiapoptotic action on pancreatic β-cells.,In vitro, Vitamin D increases transcriptional activation and expression of the insulin receptor gene, which facilitates both basal- and insulin-stimulated glucose oxidation and results in improved insulin sensitivity. Effects of Vitamin D on immune cells might also affect diabetes development since inflammatory factors have been linked to insulin resistance (IR) which is a key feature of type 2 diabetes. Most observational studies show an inverse relationship between Vitamin D level and plasma glucose , and IR., However, to prove causality randomized controlled trials (RCTs) is required. In fact, results of RCTs are mixed,,, recent systematic review showed borderline improvement in glycated hemoglobin (HbA1c) and fasting plasma glucose (FPG) in prediabetic patients treated with Vitamin D, but results in patients with established diabetes and normal persons are not significant. The aim of our RCT study is to investigate the effect of Vitamin D treatment on metabolic markers in participants with low serum 25(OH)D concentration and autoimmune thyroid disease. In this double-blind, placebo-controlled, randomized clinical trial which was conducted from February to July 2015 in Isfahan Endocrine and Metabolism Research Center, 120 hypothyroid or euthyroid adults with positive TPO-Ab were selected by consecutive sampling method. Hypothyroid patients were euthyroid and stable on levothyroxine at least for 6 months or had mild hypothyroidism on enrollment thyroid-stimulating hormone ([TSH] <15 mU/L). Serum Vitamin D levels of selected patients were measured. Those people were Arian, 18–60-year-old who lived in Isfahan with 25(OH)D ≤ 20 ng/mL were included in the study. Fifty-nine percent patients in placebo group and 70% in Vitamin D-treated group were female. Patients with renal or liver disease, cancer, pregnancy, severe weight loss and those who were on immunosuppressive medication, insulin, sulfonamides or any supplements were excluded from the study. Those patients who were on levothyroxine, metformin, or statins treatment enrolled if their medications had been started at least 6 months before enrolment and no dose adjustment was done during the study period. We selected Hashimoto thyroiditis patients to evaluate Vitamin D deficiency treatment effects on autoimmune markers at the same time in another study. Finally, 65 persons enrolled the study. Participants were randomized by block randomization to case (Vitamin D-treated) and control (placebo-treated) groups. Randomization was performed by a third person, and sealed drug boxes with label A or B were given to each person. Neither patients nor researchers knew the content of the boxes. After trial, the codes were broken. Patients in Vitamin D-treated group (n = 33) were assigned to receive pearls of Vitamin D, 50000 unit weekly, and those in control group (n = 32) were received pearls of placebo for 12 weeks [Figure 1]. Both Vitamin D and placebo pearls had the same shape and size were provided and manufactured by Zahravi's pharmaceutical company, Tehran-Iran. Study design explained to each person, and participants knew that they may receive Vitamin D or placebo, blindly, and if they were in placebo group, their Vitamin D deficiency will be corrected by treatment after completion of the study. Each participant gave written informed consent. The research protocol was complied with the ethical standards of the Helsinki Declaration (Edinburgh 2000) and approved by the Regional Ethics Committee of Isfahan University of Medical Sciences. The trial also was registered in the Iranian registering of clinical trials with the registration number IRCT2014120520216N1. Demographic characteristics and medical history of all studied population were recorded. Physical examination was done by an expert endocrinologist. The blood pressure was measured by ERKA sphygmomanometer, weight and height by SECA stadiometer, and waist circumference by tape meter. Body mass index (BMI) was calculated by dividing weight (kg) by square of height (m2). At the beginning and at the end of the trial, two blood samples were taken from each person, one clot and one ethylenediaminetetraacetic acid-containing blood sample. Biochemical tests including calcium (Ca), phosphorus (P), albumin, C-reactive protein (CRP), blood urea nitrogen, creatinine (Cr), HbA1c, insulin, FPG, triglyceride (TG), total cholesterol (Chol), and high-density lipoprotein (HDL) were measured on the day of sampling. However, the serum samples taken to measure TPO-Ab, TSH, 25(OH)D, and parathyroid hormone (PTH) froze and stored at −20° to be analyzed at the same time with the second sample at the end of the trial. Homeostasis model assessment of beta-cell function (HOMA-B) and HOMA-IR was calculated. All biochemical tests were done by photometric assays (BT 2000) using Pars kit (Tehran, Iran). TPO-Ab, insulin, PTH, and TSH were measured by chemiluminescent immunoassay method (Advia centaur CP, Siemens Healthcare Diagnostic Inc., USA). HbA1c was measured by high-performance liquid chromatography (Arkray, Adams Japan). Vitamin D measured by enzyme-linked immunosorbent assay kit (immunodiagnostic system limited, UK). Continuous quantitative variables were expressed as mean and standard error (SE) of the mean (SE), and qualitative variables as frequency and percentage. Normality of data was evaluated by Kolmogorov–Smirnov test and normal Q-Q Plots. Log transformation was used for skewed data. Paired t-test was used for within-group comparison, between-group comparison was performed by multivariate analysis of covariance. To compare the qualitative variables, Chi-square test was used. All data analysis was done using SPSS for Windows, version 20 (SPSS Inc., Chicago, IL, USA). P < 0.05 was statistically significant. During this trial, 65 adult participants with positive TPO antibody were allocated to Vitamin D-treated (n = 33) and placebo-treated (n = 32) groups. Nine persons (3 and 6 in Vitamin D-treated and placebo-treated groups, respectively) out of all participants who attended the baseline examination did not complete the trial or excluded from the study [Figure 1]. Baseline characteristics of studied population are presented in [Table 1]. Participants in two groups were similar regarding demographic, anthropometric and laboratory data including 25(OH)D concentration (P = NS). Serum 25(OH)D increased from baseline (12.76 [0.74] ng/mL to 45.53 [1.84] ng/mL, P = 0.001) in the Vitamin D-treated group and remained low (13.28 [0.86] ng/mL vs. 14.92 [1.06] ng/mL, P = 0.09) in the placebo-treated group. The difference between two groups was statistically significant (P = 0.001). Conversely, plasma PTH decreased in the treatment group while remaining unchanged in the placebo-treated group (37.94 [2.26] ng/mL vs. 43.99 [2.27] ng/mL respectively, P = 0.05). Mean cholesterol level decreased in the placebo-treated group from baseline during study (185 [6.21] mg/dL to 179.63 [7.19] mg/dL, P = 0.34), but increased in the Vitamin D-treated group (188.58 [7.36] mg/dL to 205.89 [10.67] mg/dL, P = 0.06) after 12 weeks, difference between two groups was statistically significant (P = 0.04). The mean of FPG, cholesterol, TG, HDL, CRP, Ca, Insulin, PTH, HbA1c, HOMA-IR, HOMA-B, and Vitamin D at baseline and after trial are presented in [Table 2]. 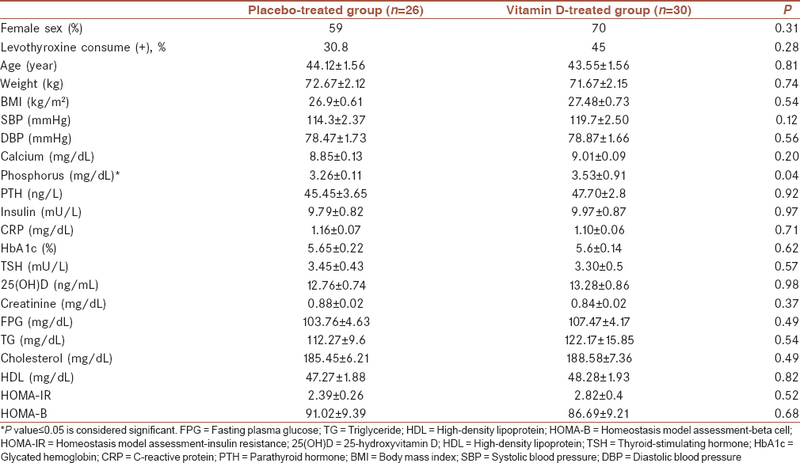 In within-group comparison, mean of HbA1c and insulin was increased significantly both in Vitamin D-treated and placebo-treated groups (P < 0.05). Other variables had not significant change after trial (P > 0.05). In between-group comparison, there was not any significant difference between Vitamin D-treated and placebo-treated groups regarding measures of insulin secretion (HOMA-B), HOMA-IR, FBG, HbA1C, and TG (P > 0.05). There were no cases of hypercalcemia or kidney stones or any other complication during the study. The discrepancy between the findings of epidemiologic surveys and intervention studies regarding Vitamin D and type 2 diabetes is remarkable. Most cross-sectional studies found a revers relationship between 25(OH)D serum concentrations and type 2 diabetes ,,, while others revealed an independent inverse association only in women.,, One meta-analysis including twenty-one prospective studies showed that there was inverse association between serum 25(OH)D levels and incidence of type 2 diabetes after adjusting for BMI and intermediate biomarkers (included 4996 incident cases of diabetes and 76220 nondiabetic controls). In the largest randomized clinical trial, in regard to the role of Vitamin D in type 2 diabetes to date, the secondary analysis of Women's Health Initiative clinical trial did not notice any effect from daily intake of 1000 mg calcium plus 400 IU/day Vitamin D on the incidence of diabetes over 7 years. In another large randomized trial, the randomized evaluation of calcium OR Vitamin D trial, daily intake of 800 IU Vitamin D3, and 1000 mg calcium had no effect on the incidence of diabetes over 2–5 years. Recently, one systemic review of RCTs that their main outcome of interest was about the effect of Vitamin D supplementation on FPG, incidence of diabetes, indices of IR (HOMA-IR), indices of β-cell function (HOMA-B) and hemoglobin A1C in normal adults, prediabetics, or type 2 diabetes patients found no effect of Vitamin D supplementation on these outcomes in normal adults or diabetic patients. However, in studies examining prediabetic patients, improvement in HbA1c and FPG in Vitamin D receiving groups bordered on statistical significance. Possible explanation for lack of an effect found in intervention studies might be related to the patient characteristic, duration of the study, dosage, and other confounding variables. Most RCTs showed no improvement in lipid profiles after Vitamin D supplementation,, while a greater decrease in serum TG identified in Vitamin D-treated group in one study. Strengths of our study are randomized double-blind, placebo-controlled study design, and similar baseline characteristic in both groups (intervention and control groups). In addition, most of our patients had severe Vitamin D deficiency, which supposed to benefit more from Vitamin D treatment. Another major strength of this study was verification of adequate target level of serum 25(OH)D at the end of trial. Our study also had some limitations. First, we could not assess long-term effects of Vitamin D treatment on outcome measures since the intervention duration was just 12 weeks. If we could extend our study for longer period, we would have found some effects of Vitamin D treatment on outcome measures. However, it was not ethical to keep patients in placebo group for long period in Vitamin D deficient status. On the other hand, we used HOMA-IR as index of IR instead of hyperinsulinemic-euglycemic clamp test, which is the gold standard for assessing insulin sensitivity. Weekly 50000 IU oral Vitamin D3 for 12 weeks did not improve metabolic markers, insulin sensitivity, or insulin secretion indices in Vitamin D deficient patients with Hashimoto thyroiditis. Zhang P, Zhang X, Brown J, Vistisen D, Sicree R, Shaw J, et al. Global healthcare expenditure on diabetes for 2010 and 2030. Diabetes Res Clin Pract 2010;87:293-301. Johnson JA, Grande JP, Roche PC, Kumar R. Immunohistochemical localization of the 1, 25(OH)2D3 receptor and calbindin D28k in human and rat pancreas. Am J Phys Endocrinol Metab 1994;267:E356-60. Bland R, Markovic D, Hills CE, Hughes SV, Chan SL, Squires PE, et al. Expression of 25-hydroxyvitamin D3-1alpha-hydroxylase in pancreatic islets. J Steroid Biochem Mol Biol 2004;89-90:121-5. Cade C, Norman AW. Vitamin D3 improves impaired glucose tolerance and insulin secretion in the Vitamin D-deficient rat in vivo. Endocrinology 1986;119:84-90. Eliades M, Pittas AG. Vitamin D and type 2 diabetes. Vitamin D. New York: Springer; 2010. p. 895-920. Norman AW. Minireview: Vitamin D receptor: New assignments for an already busy receptor. Endocrinology 2006;147:5542-8. Maestro B, Campión J, Dávila N, Calle C. Stimulation by 1,25-dihydroxyvitamin D3 of insulin receptor expression and insulin responsiveness for glucose transport in U-937 human promonocytic cells. Endocr J 2000;47:383-91. Chun RF, Liu PT, Modlin RL, Adams JS, Hewison M. Impact of Vitamin D on immune function: Lessons learned from genome-wide analysis. Front Physiol 2014;5:151. Ford ES, Ajani UA, McGuire LC, Liu S. Concentrations of serum Vitamin D and the metabolic syndrome among U.S. adults. Diabetes Care 2005;28:1228-30. Forouhi NG, Luan J, Cooper A, Boucher BJ, Wareham NJ. Baseline serum 25-hydroxy vitamin d is predictive of future glycemic status and insulin resistance: The medical research council ely prospective study 1990-2000. Diabetes 2008;57:2619-25. Alvarez JA, Ashraf AP, Hunter GR, Gower BA. Serum 25-hydroxyvitamin D and parathyroid hormone are independent determinants of whole-body insulin sensitivity in women and may contribute to lower insulin sensitivity in African Americans. Am J Clin Nutr 2010;92:1344-9. Liu E, Meigs JB, Pittas AG, McKeown NM, Economos CD, Booth SL, et al. Plasma 25-hydroxyvitamin d is associated with markers of the insulin resistant phenotype in nondiabetic adults. J Nutr 2009;139:329-34. Grimnes G, Figenschau Y, Almås B, Jorde R. Vitamin D, insulin secretion, sensitivity, and lipids: Results from a case-control study and a randomized controlled trial using hyperglycemic clamp technique. Diabetes 2011;60:2748-57. Pham TM, Ekwaru JP, Loehr SA, Veugelers PJ. The relationship of serum 25-hydroxyvitamin D and insulin resistance among nondiabetic canadians: A longitudinal analysis of participants of a preventive health program. PLoS One 2015;10:e0141081. Seida JC, Mitri J, Colmers IN, Majumdar SR, Davidson MB, Edwards AL, et al. Clinical review: Effect of Vitamin D3 supplementation on improving glucose homeostasis and preventing diabetes: A systematic review and meta-analysis. J Clin Endocrinol Metab 2014;99:3551-60. Jorde R, Sneve M, Torjesen P, Figenschau Y. No improvement in cardiovascular risk factors in overweight and obese subjects after supplementation with Vitamin D3 for 1 year. J Intern Med 2010;267:462-72. Matthews D, Hosker J, Rudenski A, Naylor B, Treacher D, Turner R. Homeostasis model assessment: Insulin resistance and β-cell function from fasting plasma glucose and insulin concentrations in man. Diabetologia 1985;28:412-9. Cavalcante R, Maia J, Mesquita P, Henrique R, Griz L, Bandeira MP, et al. The effects of intermittent Vitamin D3 supplementation on muscle strength and metabolic parameters in postmenopausal women with type 2 diabetes: A randomized controlled study. Ther Adv Endocrinol Metab 2015;6:149-54. Mauss D, Jarczok MN, Hoffmann K, Thomas GN, Fischer JE. Association of Vitamin D levels with type 2 diabetes in older working adults. Int J Med Sci 2015;12:362-8. Bellan M, Guzzaloni G, Rinaldi M, Merlotti E, Ferrari C, Tagliaferri A, et al. Altered glucose metabolism rather than naive type 2 diabetes mellitus (T2DM) is related to Vitamin D status in severe obesity. Cardiovasc Diabetol 2014;13:57. Calvo-Romero JM, Ramiro-Lozano JM. Vitamin D levels in patients with type 2 diabetes mellitus. J Investig Med 2015;63:921-3. Stadlmayr A, Aigner E, Huber-Schönauer U, Niederseer D, Zwerina J, Husar-Memmer E, et al. Relations of Vitamin D status, gender and type 2 diabetes in middle-aged Caucasians. Acta Diabetol 2015;52:39-46. Gao Y, Wu X, Fu Q, Li Y, Yang T, Tang W. The relationship between serum 25-hydroxy Vitamin D and insulin sensitivity and? ß-cell function in newly diagnosed type 2 diabetes. J Diabetes Res 2015;2015:636891. Guo C. Relations of Vitamin D status, gender and type 2 diabetes in middle-aged Caucasians. Acta Diabetol 2016;53:335-6. Song Y, Wang L, Pittas AG, Del Gobbo LC, Zhang C, Manson JE, et al. Blood 25-hydroxy Vitamin D levels and incident type 2 diabetes: A meta-analysis of prospective studies. Diabetes Care 2013;36:1422-8.
de Boer IH, Tinker LF, Connelly S, Curb JD, Howard BV, Kestenbaum B, et al. Calcium plus Vitamin D supplementation and the risk of incident diabetes in the Women's Health Initiative. Diabetes Care 2008;31:701-7. Avenell A, Cook JA, MacLennan GS, McPherson GC; RECORD trial group. Vitamin D supplementation and type 2 diabetes: A substudy of a randomised placebo-controlled trial in older people (RECORD trial, ISRCTN 51647438). Age Ageing 2009;38:606-9. Mohamad MI, El-Sherbeny EE, Bekhet MM. The effect of Vitamin D supplementation on glycemic control and lipid profile in patients with type 2 diabetes mellitus. J Am Coll Nutr 2016;35:399-404. Muñoz-Aguirre P, Flores M, Macias N, Quezada AD, Denova-Gutiérrez E, Salmerón J. 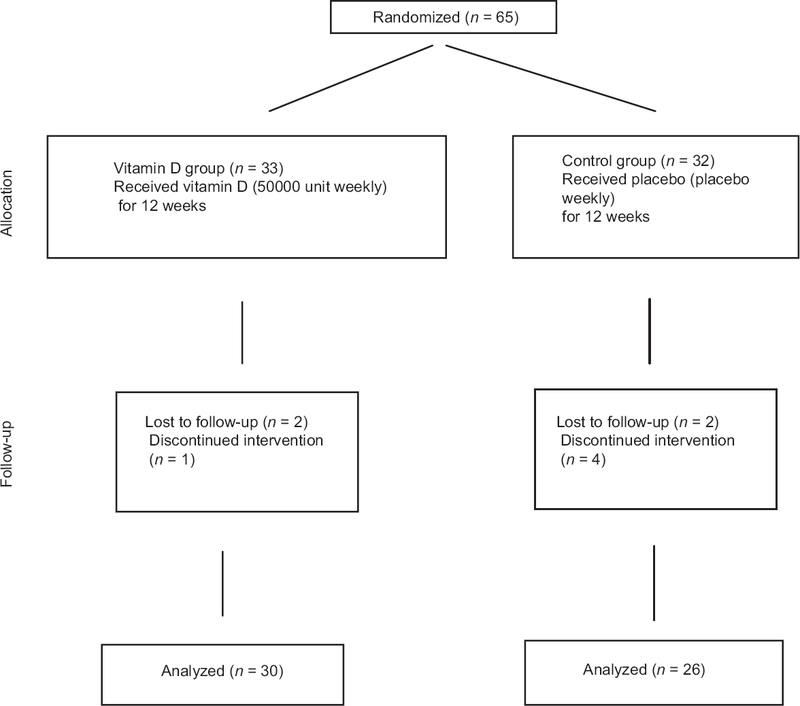 The effect of Vitamin D supplementation on serum lipids in postmenopausal women with diabetes: A randomized controlled trial. Clin Nutr 2015;34:799-804.